Shepard and Aria first discover Nyreen in the secret tunnels underneath Omega proper. Immediately, Aria is suspicious of Nyreen's reasons for being back on Omega but invites her to come along with herself and Shepard to their rendezvous point. Nyreen helps them fight their way through Cerberus' forces to a bunker on D-deck that acts as Aria's temporary headquarters. When they arrive, Aria takes the opportunity to question Nyreen about why she returned to Omega. Nyreen reveals that she never actually left Omega, though wishes she had, what with current events. 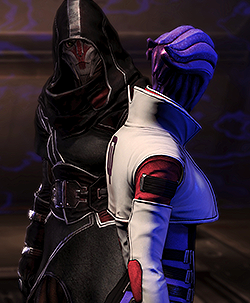 Aria congratulates her on keeping her presence hidden for so long and asks if Nyreen, despite her previous reservations about Omega's moral bankruptcy, if she is willing to help defend the station. Nyreen says she is and Aria tells her to talk to her duty officer. Once Nyreen departs, Aria asks her first-hand man, a batarian named Bray, to keep an eye on her. Aria and Shepard go on to plan their next course of action. Aria explains that they've lost a lot of their forces and Shepard tells her they'll need to find allies. Aria informs Shepard that there is still an active mercenary group on Omega -- the Talons -- and that recruiting them is their only option for fielding a force large enough to take on Cerberus. As they discuss this, Bray returns to say that Nyreen has disappeared. Aria assumes that Nyreen has used one of the secret access tunnels for escape; she's furious but there's little she can do in current circumstances. Shepard and Aria move out and Aria talks about the Talons; she explains that they weren't even a blip on her radar until Shepard's war against the plague several years ago that left a gap of power among the mercenary gangs. Darius, the current Talons leader at the time, took the opportunity to make a grab for power. Shepard asks if they're recruiting the Talons because they're good or because they're the only option left; Aria says the Talons are to act as cannon fodder and nothing more. As they continue, Aria gets an incoming message saying that Cerberus is launching an attack on the Talons and recon info tells them that the Talons leader might be in the area. After fighting through Cerberus, Shepard and Aria come across some grunts attacking a few members of the Talons. Nyreen (no longer hooded) drops down from the rafters and quickly takes out all of the Cerberus gruns with her assault rifle and biotics, much to the surprise of both Shepard and Aria. Nyreen orders her Talons to take care of the wounded and one of them calls her "boss." Nyreen explains she had taken control of the Talons shortly after Cerberus began their assault on the station and organized them into a formidable military force dedicated to protecting the civilians on Omega. She had to keep her identity as leader of the Talons hidden from Aria in order to see if Aria's plans would interfere with the goals of the Talons. She decides against joining forces with Aria but reconsiders when Shepard tells her they're there to help her. Nyreen accepts the offer and brings them to an outpost currently being attacked by Cerberus forces. 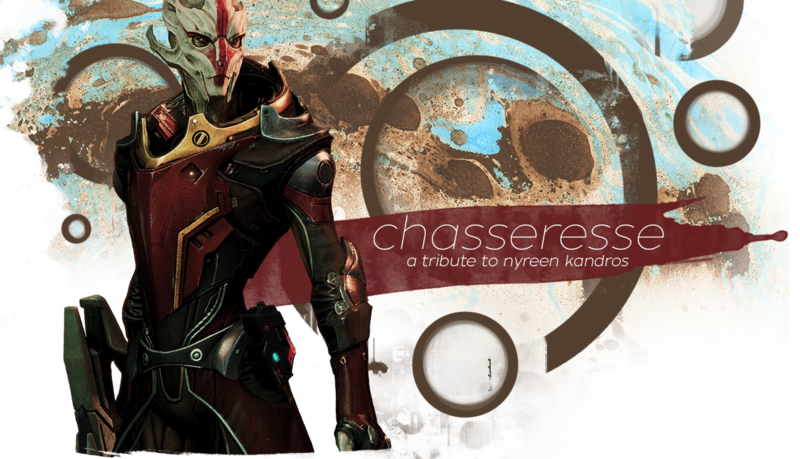 "My, my... Nyreen. Aren't you full of surprises." After arriving at the outpost, Nyreen receives intel that the civilians arrived safely at their other outpost and that there are no new developments regarding the adjutant presence. Shepard asks what the adjutants are and Nyreen explains that they're created by Cerberus that are able to replicate themselves by eviscerating their victim's DNA. Aria, having fought them before, says they're a nightmare and Nyreen explains that Cerberus lost control of the adjutants; they ran rampant through Omega and the entire station would have been infected and overrun if Cerberus hadn't found a way to contain them. She then leaves Aria and Shepard to see to the defenses. Once they've successfully defended the outpost, Aria once again tries to get Nyreen to join forces with her, or else. Nyreen asks if Aria thinks she can just kill her and take over, noting that the Talons won't stand for it. Aria acknowledges their loyalty but says she'll get what she wants regardless and makes a motivating speech to the masses on Omega, encouraging them to stand up against Cerberus and rebel when the opportunity comes. Nyreen is quite vocal in her dislike of Aria's speech and tactics. "I know what you're up to, Aria. And I don't like it." Nyreen isn't the only one who disliked Aria's speech; Cerberus launches an immediate offensive. They are able to repel the attack but not without civilian casualties, so Nyreen decides to ally herself and the Talons to Aria's cause. As Nyreen takes care of her people, Aria tells Shepard she plans to take down Cerberus' force fields next, to clear the way to Afterlife. Shepard asks if the intent is to release Omega's civilians and Aria says that Cerberus will be so pre-occupied that she'll end up having the Talons and the people working for her. Shepard warns Aria not to compromise her alliance before it even takes shape. After locating the source powering Cerberus' force fields, Aria tells Shepard that the General is siphoning power from a reactor deep within one of Omega's mines. Shepard finds an access point that isn't being cut off by force fields; a route that leads through the powered down processing plant. They decide to take this route and Nyreen appears, telling them they aren't going without her. When the trio make their way down to the processing plant, they find several dead Cerberus soldiers. Nyreen is disturbed by this find, either because she may believe they're civilians or allies at first, or because the corpses are completely eviscerated; something only the adjutants would have done. The trio press on and clear through the processing plant and take an elevator upwards to the generator. Upon entering the area, they discover themselves completely closed in by force fields -- they've been lured into a trap by the General. Aria, refusing to accept defeat, uses her biotic abilities to rip a hole open in one of the force fields long enough for Shepard to exit. Unfortunately, Aria and Nyreen find themselves under attack by Cerberus' mechs and must fight them off while Shepard figures out a way to power down the force fields. Nyreen encourages Shepard to try to reroute power to save civilian lives, while Aria argues they don't have the time. They're barely hanging on versus Cerberus at this point; Nyreen is already down and Aria's forced to hold off the mechs while trying to tend to Nyreen's wounds, when Shepard finally breaks down the force fields. Nyreen: "Spirits... Aria! How did you know you could do that?" Aria: "I didn't." Afterwards, Shepard asks Aria and Nyreen if they're alright. Aria is pissed off because she nearly died while Shepard was trying to save lives, but Nyreen manages to convince her that it was the right thing to do. "Shepard tried rerouting power to save innocent lives. It was the right thing." As the force fields shut down, the civilians break out in droves and begin to attack Cerberus. As Aria, Nyreen and Shepard are about to make their way to Afterlife, Aria gets a message from Bray, reporting that Cerberus is attempting to detonate explosives to Omega's support columns. Aria and Shepard decide to deal with Cerberus while Nyreen goes on ahead. Once the bombs are dealt with, Aria radios Nyreen to ask what her status is. Nyreen reports that she and the Talons are moving through the Gozu district but Cerberus has begun attacking civilians. Aria tells her that she and Shepard are on their way but when they arrive, they find out that Nyreen has scouted ahead. Alarmed, Aria notices that Nyreen has gone on towards Afterlife alone and she and Shepard rush towards the night club. "We're holding our own, but Cerberus has started targeting the civilians. Reports of casualties are coming in from all sectors." As Nyreen scouts ahead, she sees Cerberus release several adjutants on the resisting civilians. Knowing full well that the civilians don't have the required training to deal with them, Nyreen leaps into the fray. She pulls the adjutants into a biotic barrier and releases several live explosives... Aria and Shepard arrive just in time to see Nyreen turn to look at them one last time before the explosives are detonated, killing herself and the adjutants all in one blow. Aria explodes in fury and rage at the sight of losing Nyreen and barrels her way into Afterlife with murderous intent, only to get caught in a trap set by the General. Shepard is forced to fight through the remaining adjutants and Cerberus forces to free Aria, and the two of them confront the General, who accepts his defeat. With Omega now free from Cerberus control, Aria makes another speech to the station's inhabitants to let them know that she is now back in control. She congratulates them on their victory and makes sure that the dead will be memorialized. Once Shepard leaves, he gets a last message from Bray that informs him the Talons are now a security force on Omega and a new leader has taken over that will honor Nyreen's memory.